Paparᾱrangi Kindergarten reverts to original Maori name. Paparᾱrangi Kindergarten has a new name, but it’s really an old name, rediscovered as part of the kindergarten’s investigation into local history. The new name was unveiled at the kindergarten’s Matariki breakfast last Friday, and it now adorns the new waharoa above the entranceway. 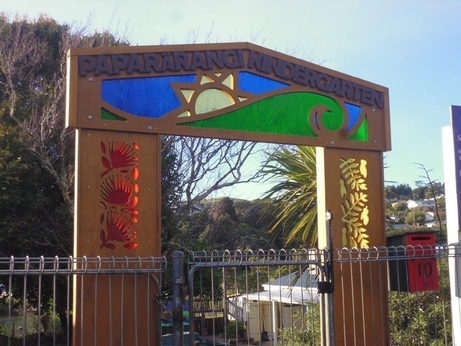 The name of the suburb, Paparangi was once Paparᾱrangi – and the teaching team has been talking about reclaiming the old name for several years. With the new entrance way, it seemed a good time to put a sign up with the new name. The teaching team consulted with kaumatua from the local papakainga, which had already taken the name back. The Wellington Tenths Trust was also consulted to check there was support for the name change, and the views of families at the kindergarten were also canvassed. Legal processes are underway to change the official name of the centre with the Ministry of Education. The name incorporates earth, sun and sky, and also refers to a nearby range of hills that is clearly visible from the kindergarten. The local papakainga has already reclaimed the name of Paparᾱrangi. The children have learned the new name very quickly and are now correcting teachers and parents when they forget.